Russia’s ambassador to the United States spoke to CNN about the security surrounding the Olympics and cooperation with the United States. Sergei Kislyak, Ambassador of the Russian Federation to the United States, gave an interview to Candy Crawley of CNN’s State of the Union, on Jan. 26 to discuss the choice of Sochi as an Olympic host city and the reality of terrorist threats against the Games. The ambassador also noted that Sochi was not, actually, next to a war zone as there is no war zone in Russia. After Crawley clarified that she meant that Sochi was located near an area where recent terrorist attacks had taken place, Kislyak said that terrorism is a global phenomenon and that people may become victims of terrorism anywhere. However, Kislyak did say that Russian law enforcement took the threat of terrorism very seriously. “We do not take it lightly,” Kislyak said. “We have good planning. We have excellent specialists who are working on it. We have an excellent team who is working to deny terrorists any chance of success. Crawley then showed a recent Quinnipiac Univeristy poll in which 50 percent of Americans thought a terrorist attack at Sochi was likely and asked Kislyak what words of reassurance he could offer. The ambassador said that most of the attendees at the Games would be Russian, and that Russians, knowing their country and the situation, were not afraid of attending the events. Crawley also asked the ambassador about reports that Russian law enforcement officials had not been open to cooperation with their American counterparts on security in Sochi. 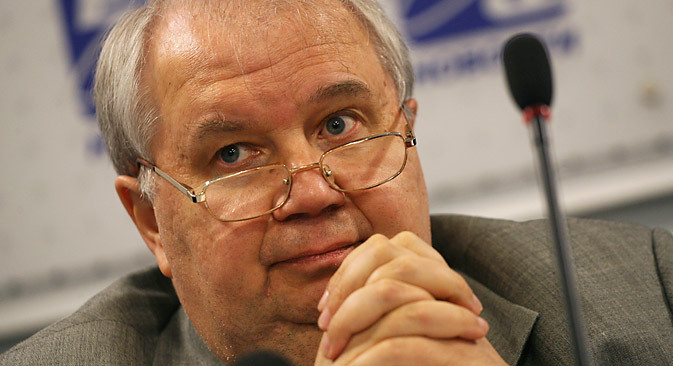 Kislyak said that he believes that cooperation between the two groups is actually pretty good and that there are no political issues between the countries, such as disagreements over Iran, Syria or Edward Snowden, that are affecting cooperation on security at the Olympics.